Last summer, I optimistically planted a yellow rose bush. 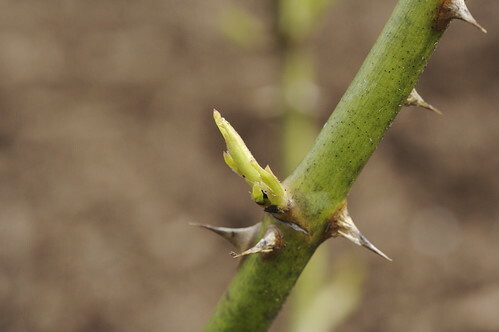 Yellow roses are notoriously fragile plants. They just don’t like Vermont winters very much. But we’d had at least one hardy yellow rose bush back before we moved the house (it was of the climbing rose variety), so I really expected this new one to survive just fine. I didn’t bother to protect it with hay or fabric or anything. I just let winter come and cover it with snow. When the snow melted, this poor plant looked dismal. 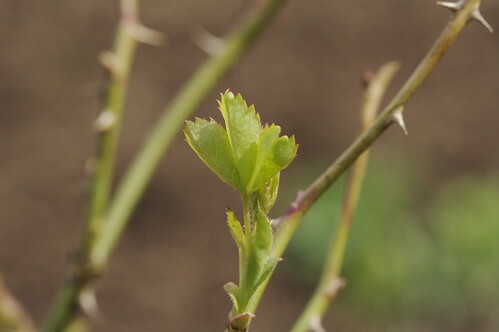 Many of its branches were black/brown, and, while the other rose bushes and the lilacs brazenly showed off fresh buds at least a couple weeks ago, the yellow rose just looked dead. I examined its branches every day when I set out for a walk and saw nothing fresh and green about it. And it has all summer to be coddled by me. And, by golly, you can bet I’m putting a parka around it next fall.